Up until now I haven’t given the set to my first animated shot much love, so I decided to spend a few hours trying to do just that. 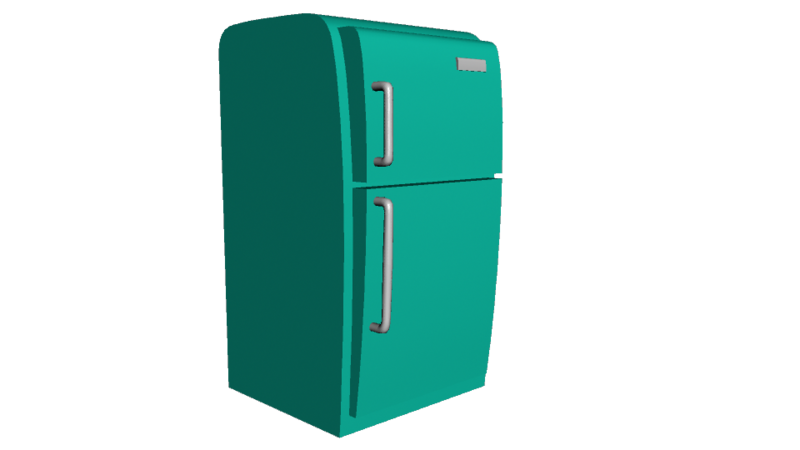 I knew that I wanted to have a retro feel to my fridge so I did some research and found a handful of photos of retro refrigerators and used them as reference when modeling in Maya. Overall I’m very happy with how my fridge model turned out but please keep in mind that I’m not a modeler so my work here is very basic and elementary. Nevertheless, here it is and I’m pleased with it! >The screen follows the text message into the digital space and becomes a physical letter. >The manager sees a red message “FAILED TO DELIVER”. >He goes over and picks it up, remembers the boyfriends name on it and just puts it in the “Girlfriend” tube. >Immediately the computer lights up and the manager runs back. >We see a red letter going through the tubes and it becomes obvious what happened. >Manager begins typing furiously to close the gates and stop the letter. >Letter gets stuck in the last gate as the manager closes it. >The message enters the digital space and becomes a actual letter. >The lumbering guy begins slowly taking it to the tube to send it. >The manager becomes impatient at his speed and grabs the envelope and stuffs it in the tube. >Guy receives text message and replies to it with something as well. Cutesy stuff. Here is the latest blocking for my first animated shot. There are plenty of things to work on still, but for progress’ sake I wanted to capture a glimpse of it in its earlier stages. This is probably my 5th pass so far and I still have a few more to go after I receive some critiques on it. I get more and more happy and excited with each blocking pass! Can’t wait to see how it turns out in the end. At first it was hard to let the Fift rig go because I thought he looked so cool and would be fun to animate with. I found that I was trying to convince myself that I would be able to animate him regardless of the issues and problems I was facing. The saying, “never fall in love with your work” is totally applicable in this circumstance because, since I was so in love with the Fift rig, I was too stubborn and too attached to him to let him go. It wasn’t until my good animation friend Jessica Tong told me “You gotta roll with the punches kid” that I was able to accept the loss and look for another rig to use instead.I learned a lot from this situation: I need to be flexible not only with story ideas, but characters and rigs also. After about an hour of searching and weighing out my options, I finally came across a great little cartoony looking character that just so happens to be from Boutique23 as well. So without further ado, the new rig I will be using for my first animated shot of the semester is TRE3. When it comes to our character designs, let’s try to keep them simple since they’re going to have to be modeled & rigged in Maya. Mainly they just need a body, arms, legs, eyes, brows and a mouth (for expressions). Can we play with the 3 shapes of sphere, cube, and cylinder?? I absolutely love this character lineup! 10 characters of different shapes & sizes that help to distinguish each one of them as well as their personality and even body mechanics. Keep this in mind when designing our 3 FTD characters! I think we should keep the character designs limited to simple geometrical shapes. This picture is a terrific example because they play with size and shape (and color) to help differentiate the three characters. I’m thinking for our shot film we should have a small roundish character, a skinny tall cylindrical character, and a bulky squarish medium sized character. Sadly, after I began blocking my first animated shot for the semester, I noticed that the Fift rig could not perform certain moves that I needed him to do for this body mechanics shot. It seems that his design is hindering him from being able to reach both of his arms directly in front of himself. His shoulders are located somewhat on the back of his torso–as opposed to the outer edges–so when he reaches both arms forward, they intersect the geometry of his chest. In order to try to work around this, I rotated his shoulders forward & outward, curved his spine forward, and adjusted his root. But nothing seemed to fix the awkward breaking of the rig that I was getting. If that wasn’t enough, in one part of my shot when he leans forward to brace his feet against the fridge door, his arm jolts wildly upward for no reason. Before I decided to completely throw in the towel on Fift, I spent quite a bit of time playing with his other controls to see if I was missing anything. In the end, no amount of translating and rotating of his spine, root, hip, shoulder, neck, head, arm, and leg controls corrected the problem. So although I love the look and appeal of the Fift rig, because he can’t give me what I need, I regretfully have to stop using him and find another rig to animate my shot with. I feel that I’m making the right decision because 1) even if I did manage to fix this, I don’t want to risk it occurring again throughout the rest of my shot, and 2) I don’t want to have to fight a rig throughout a scene; it’s difficult enough animating a rig that works properly, I can’t even imagine having to suffer the agony of animating a shot with a rig that isn’t working. In the following video you can see that when he reaches up to the fridge door handle (00:02), some funky stuff happens on his back that I wasn’t able to rectify. Also, when he leans forward and lifts his leg up to the fridge, his arm flings about spastically (00:03). Based on the information in the book Invisible Ink: A Practical Guide to Building Stories That Resonate by Brian McDonald. Who is the story about? Where are they? When is all this taking place? With characters and setting established, you can begin to tell the audience what everyday life is like in this world. when one thing happens, it causes something else to happen, and that causes something else to happen, etc. think one step closer, two steps back, etc. What does the protagonist (along with supporting characters) do to solve the major conflict of the story? Once we know what happened, the closing scenes tell us what the story means for the protagonist, for others in the narrative, and (not least of all) for those of us in the audience.